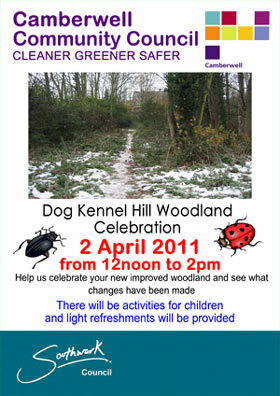 Work in and around the wood has nearly been completed and to celebrate, the council are organising an open day. The event takes place on Saturday 2nd April from 12pm til 2pm. The project manager from the council will be there to canvas opinion on what to do with the next round of funding and what should be included on the notice board that they want to put up in the park. The friends group will be there trying to get new members and generally telling people that we exist. We also desperately need to raise funds to cover the cost of things like the website hosting, printing and photocopying of leaflets so we can carry on our work. Luckybird have donated some of their gorgeous hand printed cards to sell and we’ve got nature trails for children to enjoy.